How do "pause"​ and "power"​ work for you? In the privilege of serving human potential optimization with bright leaders for 20+years, one reaches a fascinating relationship between pause and power. 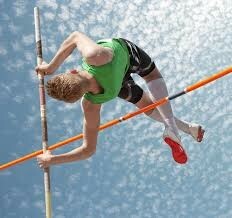 Consider the master pole vaulter who clears the highest bar and wins the event because of how well he backed up in order to take flight. Before I get too preachy, um, it's confession time. Earlier today, I was all dressed, lipstick-ready, about to hop in the car (hey, if it's a work-at-home, no video meeting day, it might be yoga pants and no makeup) and checked email to discover two last minute client reschedules. OK, no problem, I'll work on new project X. Then I see an email from my assistant on this project that she's sick. "Last night my wife and I decided to go (...trip), so I need the afternoon to ...Sorry about short notice...I understand if you must debit my time. Keep changing the world." I wrote back about cancellations and shared that I like to ask, Hmm, what is the invitation here? e.g. to pause even more myself, step back and contemplate true choices, strategic priorities, what's the next right best use of me, and so on. These are relevant for his options and CEO role as well, so I wrote, "Enjoy unplugging and clearing your head and let nature help you with your own pause button and refresh!" A funny thing happened on the way to this potential crime scene. I bumped into Scott Shute's post about stopping the glorification of "busy" and how to stop our addictive habits with email. I clicked Like, laughed, and turned my email OFF. I'm going to leave my email off for the rest of today and recommit to a wise strategic Pause (maybe including a hike. I remember after prying my white knuckles off a lucrative corporate ladder and workaholic life, how going for a long walk on a weekday afternoon made me feel so prosperous). Once upon a time Richard Branson had to make a critical decision about which business unit to sell (music or airline) and amidst all the data and advice he was bombarded with, he unplugged and walked around a lake for a few days. We could say he dropped out and in in order to come up with the best business choice. I like to ask, have we fallen into busyness or are we truly in business (fueled by inspired choices and healthy, sustainable, prosperous flow). In addition to being data-driven, how shall we be inner wisdom-wired? They say everything in life can be your teacher. I'm grateful to all of these teachers today and my own choice to back up like the master pole vaulter, pause, tune into the most powerful intelligence and let that inspire how I serve all of my current and future clients and all the lives we get to impact. I hope this gives you more permission to pause in ways that fuel your real power. Cheers! Newer PostHow could we "re-source"​ humans for the new evolution of human resources?